GSIE started in 2007 and is held every year. It aims to find ways to solve educational inequalities and information gaps in developing countries through the introduction of ICT interventions. This year, more than 70 ICT in education experts from around the world, including educational policy makers from 30 developing countries (such as Bangladesh, Cambodia, Ghana, Guatemala, Indonesia, Laos, Nepal, Paraguay, Peru, Serbia, and Uzbekistan, among others) participated in the discussion. A variety of issues were covered, including teacher ICT competency policies, communities of practice for teachers, and continuing professional development for teachers, all of which focused on strengthening the ICT capacity of teachers in the era of the Fourth Industrial Revolution. The Coalition gave two presentations at the symposium. Dr. Cher Ping Lim, Chair Professor of Learning Technologies and Innovation of the Education University of Hong Kong, spoke of the work of the Coalition and described a blended learning model for teachers in the Philippines — the Early Language, Literacy, and Numeracy (ELLN) Digital project — that will be one of the TPD@Scale models included in a collective case study being developed by the Coalition. Preliminary findings from the Coalition’s landscape review of TPD@Scale in the Global South were also presented by Project Leader Dr. Tony Lelliott of the Johannesburg-based think tank Saide. Dr. Lelliott highlighted pedagogy, learning design, and integration as critical in any technology intervention. Apart from infrastructure constraints, issues surfaced by the review so far include difficulty in evaluation, tensions between pedagogy and sustainability or scalability, diverse contexts and the need for customization, and time-dependent interventions. The symposium was also an opportunity for the landscape review team to engage with representatives from ministries of education of Global South countries to gather information on past and current TPD@Scale efforts as well as solicit inputs on their priorities, knowledge and capacity building needs, and key challenges related to scaling in their respective countries. These consultations are an integral part of the landscape review methodology and the research agenda-setting that follows. 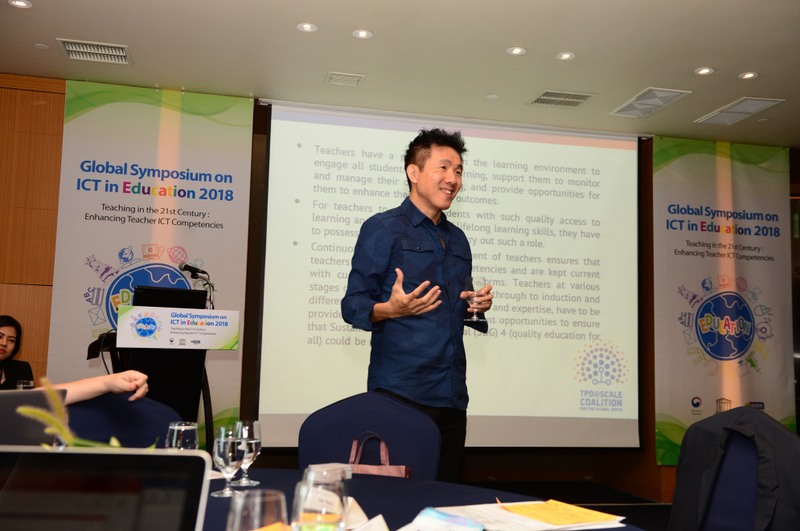 “Given the valuable knowledge and deepened experience of the Coalition in the field of teacher professional development that goes beyond borders, our partnership with the Coalition has been essential in further observing our own global outreach strategies together with all of the nations present at this year’s symposium, which was specifically focused on enhancing teacher ICT competencies in the 21st century,” said Mr. Jongwon Seo, Chief of the Global Cooperation Division of KERIS.